Infant Foam Identification Bands offer a very soft and comfortable solution for those little ones with sensitive skin. These infant wristbands feature a soft foam backing that is comfortable and gentle for all newborns. The ID Form Bands are designed to allow a releasing option so the band can be re-positioned or re-sized. 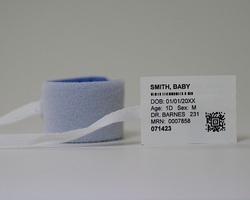 These wristbands or ankle bands allow you to attach different types of labels for a reliable positive patient identification for newborns, infants, and preemies in NICU. Printing of labels are done on either a label or a flag that is applied to the band. The flag can be used to scan barcodes or read identification information outside of blankets or clothing. The 20-323 band is our newest and most innovative product. Made with a design similar to the unshielded 20-321, it features an 8 inch extender tape for labeling which allows babies to remain swaddled while a positive ID is confirmed. This product is extremely popular in the NICU, as babies in that department are generally more sensitive and undergo more intensive treatments. Our Bar code tags and neonatal wristbands or bands, meet all requirements of JCAHO for accurate patient ID, HIPAA for protection of patient privacy, and AHA to reduce risk of lost data. Please call for contract pricing.